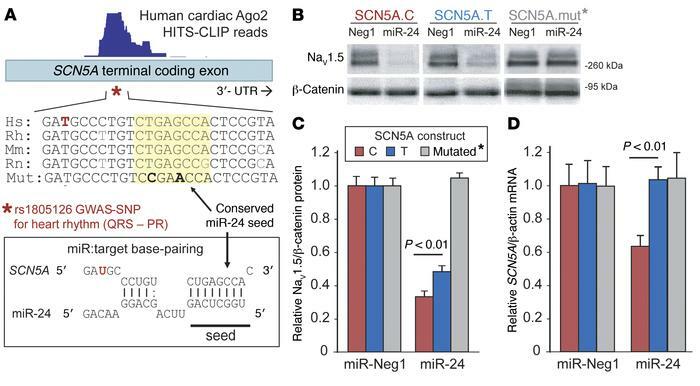 The synonymous coding SCN5A SNP, rs1805126, modulates the miR-24–SCN5A interaction. (A) Schematic of the conserved miR-24–SCN5A interaction identified by Ago2 HITS-CLIP (read coverage shown above). The site resides within the coding region of the SCN5A terminal exon and is adjacent to the synonymous SNP rs1805126 (*) that has previously been linked to heart rhythm abnormalities by GWAS. (B–D) The effect of miR-24 on SCN5A expression, and the potential impact of rs1805126 on this interaction, was tested in cell culture experiments. Mouse N2a cells were cotransfected in triplicate with synthetic pre-miRs (4 nM) and human full-length SCN5A expression plasmids harboring either the C or T allele for rs1805126, or synonymous mutations that disrupt the miR-24 seed site (mut*, base mutations are indicated in bold in panel A). At 48 hours after transfection, Western blot and QPCR analyses were used to measure protein and mRNA expression. (B) Representative Western blots show that miR-24 strongly suppresses NaV1.5 expression, having a more robust effect on the C allele, relative to T. Densitometry analysis of Western blot data (n = 9 biological replicates from 3 separate studies for C versus T, n = 4 for mutated) supports a significant allele-specific difference in miR-24 suppression of NaV1.5 levels (C), as does QPCR analyses measuring SCN5A mRNA levels (D; n = 6 biological replicates from 2 studies). Data are represented as the mean ± SEM, and P values were obtained using 2-tailed unpaired t test comparing the indicated groups.